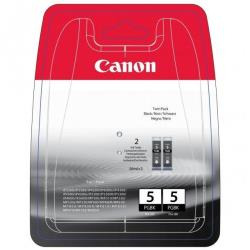 Canon PGI 5 Black Twin Pack - serbatoio inchiostro. Quantità: 2 pz. Progettato per PIXMA iP3300, iP3500, iP4200, iP4300, iP4500, iP5200, iP5200R, iP5300, iX4000, iX5000, MP500, MP510, MP520, MP520 Everyday, MP530, MP600, MP600R, MP610, MP800, MP800R, MP810, MP830, MP950, MP960, MP970, MX700, MX850.